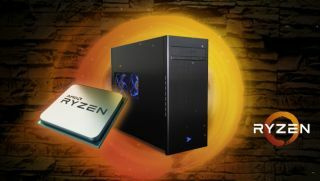 Boutique builders are expanding their lineups to include Ryzen. Right on cue, system builders are ready with new Ryzen builds that are available to customize. That includes Velocity Micro, which has on tap its Ryzen-powered Raptor M60 systems available to configure in mid-size or full-size ATX setups. Pricing starts at $1,379 for a mid-size Raptor M60, though you can save $50 from now until March 7. The base configuration includes a black aluminum mid-tower case, Ryzen 7 1700 processor cooled by AMD's Wraith air cooler, Asus B350M-A micro-ATX motherboard, 8GB of Crucial Ballistix DDR4-2400 RAM (2x4GB), GeForce GTX 1050 graphics card with 2GB of GDDR5 memory, 275GB Crucial MX300 SSD, 24X Asus DVD burner, 600W EVGA power supply with 80 Plus Bronze certification, and Windows 10. If going this route, we'd suggest spending an extra $65 to double the capacity of the SSD and paying $35 to upgrade to a GeForce GTX 1050 Ti. it's not the fastest graphics card in the world, but our testing showed it's serviceable for 1080p gaming. If you can swing, Velocity Micro offers faster graphics card options, along with beefier upgrades across the board. The full-size tower setup starts at $1,399 ($1,349 after subtracting $50) and includes the same specs. So you're essentially paying a $20 up-charge for a bigger case. As is often the case when shopping from a boutique builder, you're paying a premium for the convenience of having someone else assemble the parts and for clean cable management. A similar configuration from Newegg sans case and peripherals runs about $900. Add $100 for those missing items and factor in the $50 savings, and you're looking a price difference of $229. The Velocity Micro configurations come with a one-year parts and labor warranty and lifetime support. The boutique builder also includes a lifetime upgrade plan in which you can return your system for maintenance, upgrades, and tuning. If going that route, be sure and apply the $50 off coupon—it's in the last pull-down menu under the "Specials and Promotions" section.